I don’t know if they are still around but, when I was a little boy, thee used to be these little comics, with titles like Commando or Battle. The stories in these comics were all set during the Second World War and featured heroic, salt of the earth Tommies battling against villainous Nazis, whose vocabularies was largely limited to variations on “Achtung!” and “Schweinehund”, or Japanese, who were depicted as, basically, a collection of racial stereotypes. They were exciting but morally simplistic. I loved them but rarely got to read them as my parents were generally disapproving of comics. 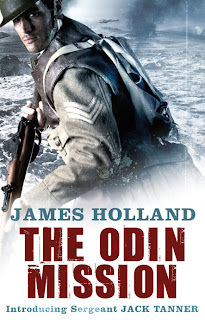 James Holland’s The Odin Mission has something of the better side of Commando comics in it. Billed as a Sharpe for the Blitz years, it is the first in a series of tales featuring Sergeant Jack Tanner of the fictional King’s Own Yorkshire Rangers. Set during the disastrous campaign to defend Norway in 1940, following the German invasion, Tanner and his group of barely trained squaddies finds itself cut off from Allied lines and with the responsibility of shepherding a Norwegian scientist to safety. He is hampered in this task not only by the efforts of the Germans, who are keen to seize the scientist and his secrets, but also by an arrogantly inept French officer, Lieutenant Chevannes, and his platoon of mountain troops. If you are looking for a sensitive look at the effects of war on men or a richly drawn, character-driven novel with a deep psychological undertone, you should probably turn away now. This isn’t it. If, on the other hand, you are in the mood for a fast-paced, action-packed tale where the good guys are heroic paragons and the bad guys might as well be wearing black, then this may well be one for you. This was the fourth and final book sent to me by Transworld as part of their book group reading challenge and it obviously got to me at just the right time, as I thoroughly enjoyed it. I was definitely in the mood for some blood and thunder action and this provided it to me in spades. James Holland is a military historian by trade and it shows. The Odin Mission is filled with historical fact and period slang. There is a real feel of the period about it, even if he is less good at making his Nordic setting come alive – his skill is clearly in the pacing and the plotting. There is nothing remotely subtle or deep about his characters. Tanner, the hero of the series is improbably heroic, despite vague hints of a disreputable past. His sidekick, Sykes, is a classically chirpy Cockney who, despite a criminal past, is on the side of the angels. By contrast, the Germans, and especially Hauptmann Zellner, who appears set to be Tanner’s nemesis in the series, are melodrama-worthy villains. Zellner establishes this beyond doubt in the first couple of pages, shooting an unarmed Norwegian farmer dead in front of his wife. Lieutenant Chevannes, Tanner’s French rival, reflects so clearly the stereotypical British view of the French that he may as well be wearing a beret and a string of onions whilst humming the Marseillaise and smelling strongly of garlic. To see this as a criticism, however, would be, I think, to miss the point. This is, and I believe is intended to be, a Boy’s Own story, to be enjoyed but not taken too seriously. On this evidence, Jack Tanner is not a Sharpe for the 20th Century as Bernard Cornwell’s creation was more rounded in characterisation and his conflicts were as much about his position in 19th Century British society with its rigid class structure, as they were about his fighting ability. The Odin Mission is Holland’s debut, however, and so maybe Tanner will develop and grow as the series progresses. Overall, this was fun and easy light reading, just right for the mood I was in when I read it, although had I been in a more thoughtful mood, I may have found it a bit shallow. Maybe the final word ion this is that I have already bought the second Jack Tanner book, Darkest Hour, and am looking forward to reading it when next I am in a light reading mood, although I do feel sorry for poor Sergeant Tanner, whom I fear is going to dragged on a circuit tour of the more unpleasant parts of World War II. I’ve now finished the four books I chose as part of the Transworld Book Group Challenge and would like to thank Transworld for the opportunity to read some new authors. I haven't come across too many light books about WWII, so I'll keep this in mind. Will link to your review on War Through the Generations. If you're looking for a reputable contextual advertising network, I suggest you take a peek at Propeller Ads.